I've done the following construction. 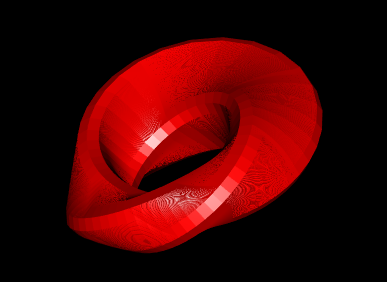 I expected to get the Clifford torus or another "Hopf torus", such as the ones we can see here: lobed Hopf tori. 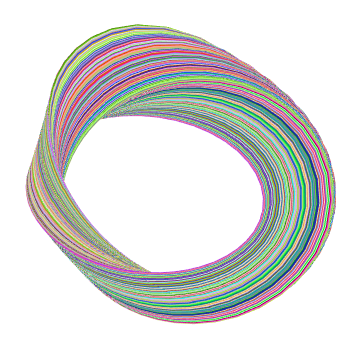 Its not ugly but this does not look like a torus. And I've never seen such a picture elsewhere. What is it? More importantly, I would like to know how to obtain the lobed Hopf tori (lobed Hopf tori). Is the way to get them close to my construction of am I totally in a wrong way ? In case I'm totally in a wrong way I would appreciate a couple of hints. Browse other questions tagged geometry geometric-topology hopf-fibration or ask your own question. Given lattice G; parameters of torus R^2/G? How do you explain the appearance of a sine in the integral for calculating the surface area of a sphere?